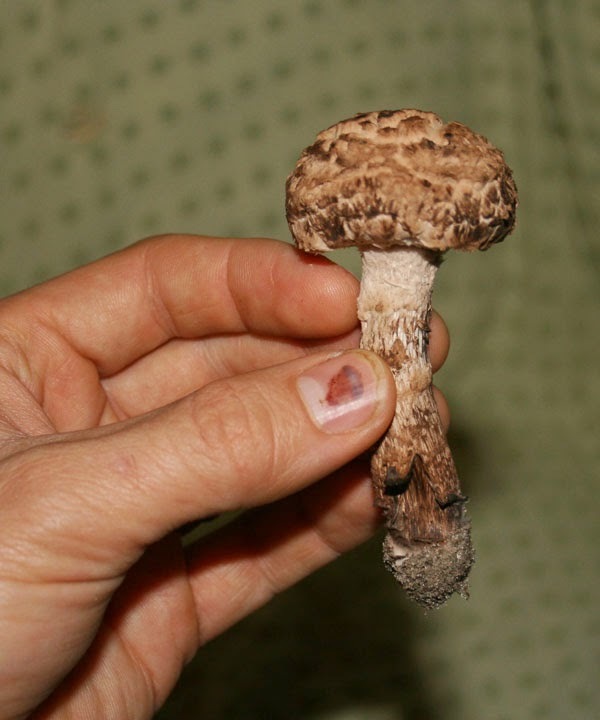 Since I've started branching out into fungi identification, I think it's good idea to start cataloging some of my experiences with wild foraging for edible mushrooms. Hopefully what I write will be helpful. And hopefully no one dies. Perhaps in the future, once I've become significantly more experienced at hunting down tasty fungal bounty, I'll be able to do a series of "Survival Mushroom Profiles" similar to my Survival Plant Profiles. 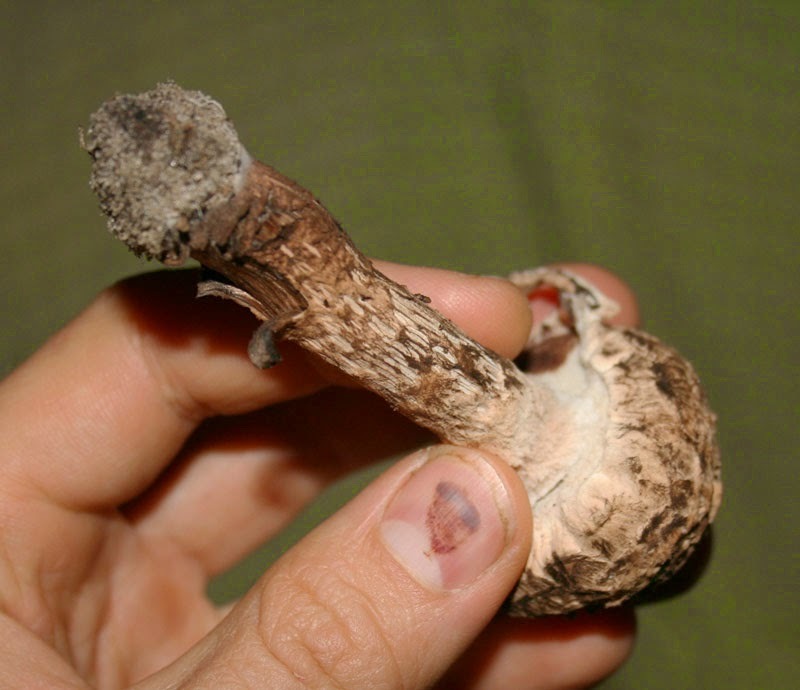 For now, I'll just tell you where I found edible mushrooms, how I identified them, and how they tasted. A couple of weeks ago I was foraging in the same empty lot where I discovered chanterelles and Lactarius indigo mushrooms. While there I came across an edible mushroom I only knew from photos - the "Old Man of the Woods:"
The Latin name on this bolete is Strobilomyces floccopus, though Michael Kuo notes in his article on the "Old Man" over at MushroomExpert.com that the classification is rather shaky. It's a pretty easy mushroom to spot for beginners. It's flaky and fluffy and has pores beneath the cap - NOT gills. If it has gills, you have something else and it may be poisonous. The Old Man of the Woods lacks gills. My thumb looks ugly. Slice or damage the flesh of an Old Man of the Woods and it will turn pink and eventually fade to black. As for flavor, it's decent. It tastes pretty much like a typical store-bought button mushroom to my unpolished palate. Sauteed in butter it's definitely good. I found this mushroom growing in mixed pine-oak woods near the base of an oak tree. It was all alone, though there were chanterelles and other varieties of boletes growing in the same patch of open woods. As edible Florida mushrooms go, this isn't at the top of the list - but it certainly isn't as blah as some authors report. For more photos of the Old Man of the Woods, check out this link. I'm not comfortable with wild mushrooms, so I'll leave that up to you and the other experts. I do have a question for you; did you hit your thumb with a hammer? I don't blame you. 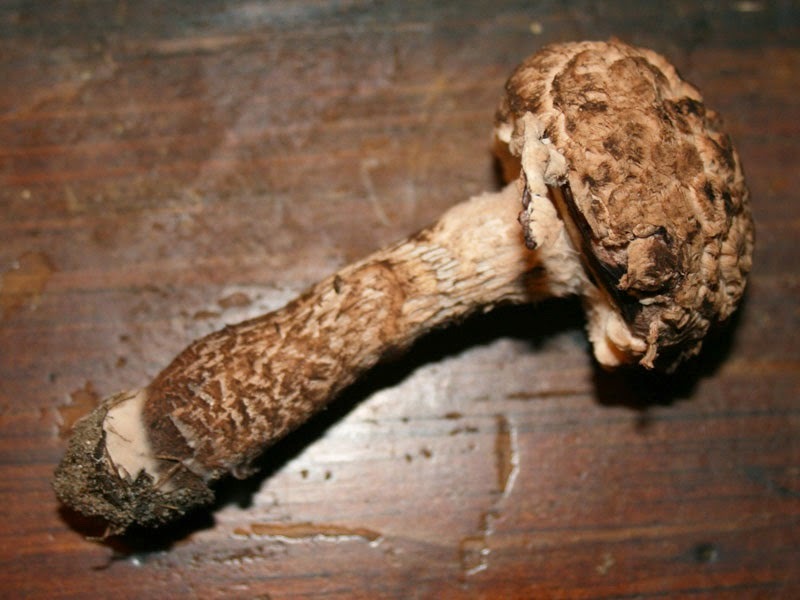 I was scared of eating wild mushrooms for most of my life until I discovered that most mushrooms won't kill you and that some with certain characteristics will never do you much more harm than an upset stomach if you pick wrong. As for my thumb: I was drilling holes in PVC elbows with a drill press. One of them caught and yanked away from me, somehow smacking my thumb really good in the process. I probably couldn't repeat the injury if I tried! I ate my first foraged mushroom tonight- a puffball the size of a tennis ball I found in my front yard. Isn't this fun?